This beautiful and elegant pair of earrings is made of Matte rodium finish cubic zirconia ear posts (925 sterling silver posts) together with Crystal White 6mm Swarovski Pearls and 13x18mm foiled back Clear White Swarovski Crystal Tear drops in rodium plated bezel frame. Last two photo feature the beautiful brides Jennie and Jodarna who are wearing these earrings on their big day. I just got these in the mail today and they are absolutely gorgeous! They will compliment my dress perfectly. They are beautifully made. Thank you so much!! These earrings were beautiful! For the price - cannot beat it! The stones are so sparkly and the earrings hang beautifully. 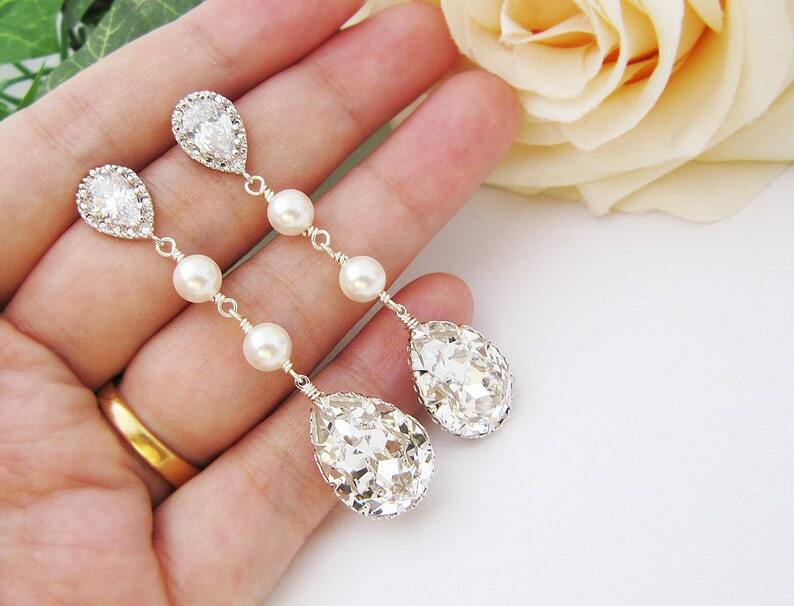 I purchased three pairs for my bridesmaids - they loved these earrings and received many compliments. Great shopping experience - thank you so much! These earrings are SO beautiful! They are the perfect size (not super small but not overly large and gaudy looking). I am in love with them. They also arrived much quicker than expected! Only about 7 days after purchasing. Thank you!